Mom jeans are back... just this time they have see through, clear knees. 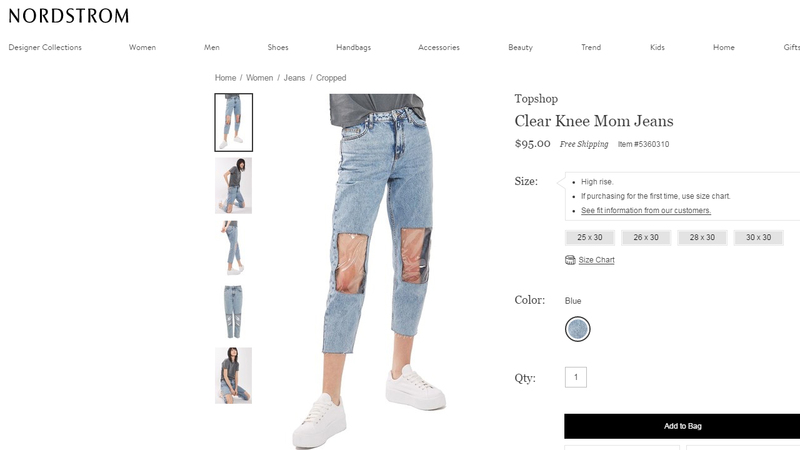 This is apparently a real thing for sale at Nordstrom, "Clear Knee Mom Jeans" which retail for $95. Why would one wear a pair? Well. the retailer describes them as, "Slick plastic panels bare your knees for a futuristic feel in tapered and cropped high-waist jeans." As a hip mom, I'm always looking to keep up with the trends. Well, with these jeans in my possession I can confidently say, "Mission accomplished!" More importantly, let's not overlook their practicality. Burping my 3 month old used to take its toll on my pants but not in these jeans. I just place him in my lap and any spit up rolls right off my knees! So long stains! I love these jeans! What do you think? Would you buy a pair and wear them?